Recording a phone call without both parties’ consent is not legal under California law. 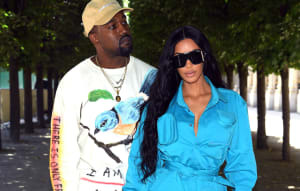 On the latest episode of Keeping Up With The Kardashians, which aired July 17, Kim Kardashian discussed the ongoing feud between Taylor Swift and her husband, Kanye West. Kim referenced her recent GQ interview in which she claimed to possess video evidence of Taylor consenting to be referenced in Kanye's The Life Of Pablo track “Famous.” This video footage wasn’t aired on the show, though — Kim saved it for her Snap Story, which she posted shortly after the episode finished. The footage has led some to question whether Kim committed a felony by recording the telephone call, which would depend on which U.S. state she was in. As Twitter users such as @‏KalebNation have pointed out, "California's wiretapping law is a "two-party consent" law. California makes it a crime to record or eavesdrop on any confidential communication, including a private conversation or telephone call, without the consent of all parties to the conversation.” So if Kim and Kanye were at home in L.A. at the time, it’s possible that Kim has committed a felony. However, other Twitter users, such as ‏@classyswifthale, have noted that apparently Kanye was in New York when the call took place. Under New York penal law, only one party to the conversation needs to give consent to recording. So Kim would be acting within the parameters of the law if, say, she was in New York prior to the Yeezy Season 3 launch in Madison Square Garden on February 11, 2016, where The Life Of Pablo premiered. After all, we know ‘Ye was tweaking the album until the last minute. All said though, it's pretty unlikely that Kim did anything without seeking legal counsel, especially given her thorough approach "send[ing] out releases," as explained in her GQ profile. A rep for Kim Kardashian did not immediately respond to a request for comment. Read on for Twitter's reaction. It's 2 am on a Monday and I'm reading federal v state law wiretapping debates in my mentions. What a world.